NetCone Review 2019: Is NetCone a Good Hosting? 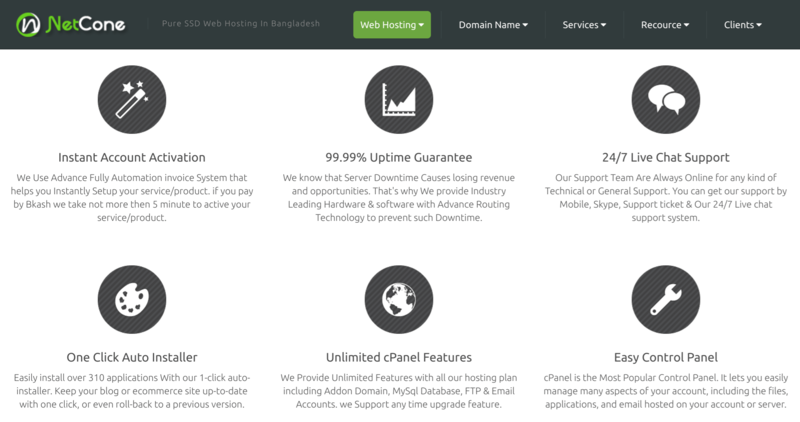 NetCone is a Bangladesh-based provider of attractively priced SSD shared hosting plans. It has nothing to offer if you want to scale beyond its shared hosting offerings. NetCone is a relatively recent entrant on the web hosting scene. It was established in Bangladesh in 2015 to provide feature-packed SSD hosting solutions and domain registration services at a fair price. Its English language website can be switched into several alternative languages. NetCone offers a wide range of hosting services which it categorizes as Shared Hosting, Business Hosting, Corporate Hosting, Premium Hosting, Reseller Hosting, and Email Hosting. The shared hosting plans for students, individuals, small businesses, corporations, and e-commerce customers all come with unlimited domains, unlimited databases, unlimited FTP and MySQL. You get the popular cPanel control panel to manage your hosted website. The Softaculous installer allows you to install WordPress, Joomla, Drupal, or another CMS with ease, or you can choose from 300+ other application installation scripts. Continuing with the good news, you can also customize your hosting to meet your personal, business, or corporate needs. However, you can’t scale up to a VPS or dedicated server with this provider because it only offers shared hosting plans. NetCone’s SSD hosting plans come at bargain basement prices. You can pay for them on a monthly, quarterly, semi-annual or annual basis using bKash, Neteller, Skrill, Payza, or wire transfer. You get one free domain for life with a yearly subscription, and the 30-day risk-free money-back guarantee should make you feel better about making this commitment. Although NetCone advertises a range of support channels such as live chat, telephone, ticketing system, and email, I was disappointed by the lack of response when I attempted to contact the company. NetCone’s nicely priced plans include above-average features to suit a wide range of webmasters. I’d feel better about this company if its support team actually supported me during my decision process. Get SSD shared hosting at bargain basement prices from Bangladeshi business NetCone. Wondering how NetCone stacks up against other Web Hosting companies? Enter any other Web Hosting company and we will give you a side-by-side comparison.